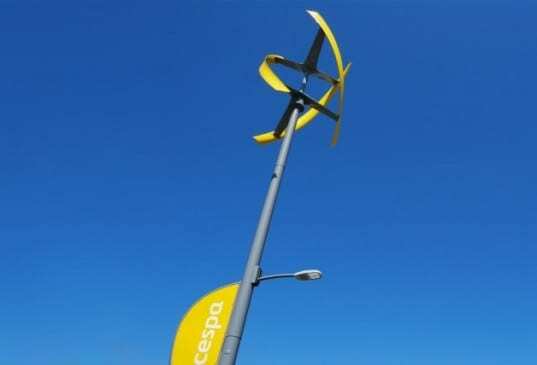 The world’s first fully integrated wind-powered EV charging station has been installed in Barcelona, Spain. The charging station, known as the Sanya Skypump, was unveiled today by Urban Green Energy and GE, and it combines UGE’s cutting-edge vertical wind turbines with GE’s electric vehicle (EV) charging technology. The Sanya Skypump was installed by UGE Iberia, the Spanish branch of New York-based Urban Green Energy at Cespa’s global headquarters near Barcelona. Who is Cespa, you ask? Well, they’re the environmental services subsidiary of Ferrovial Servicios, the world’s largest private transportation infrastructure investor—so it makes sense that they see the potential of the charging station firsthand. The two companies have already announced that further Skypumps will be installed later this year in the U.S. and Australia at shopping malls, universities and other locations. The Skypump incorporates both the energy production capacity of UGE’s 4K wind turbine and the EV charging capability of the GE Durastation in a single unit. All of the required electrical systems are located within the tower.